Cats are fun to play with. They leap, pounce, turn 180° or 360° in the air, and generally are a hoot to watch. It's crucial that you develop a routine of playing with your cat every day for his entire life. 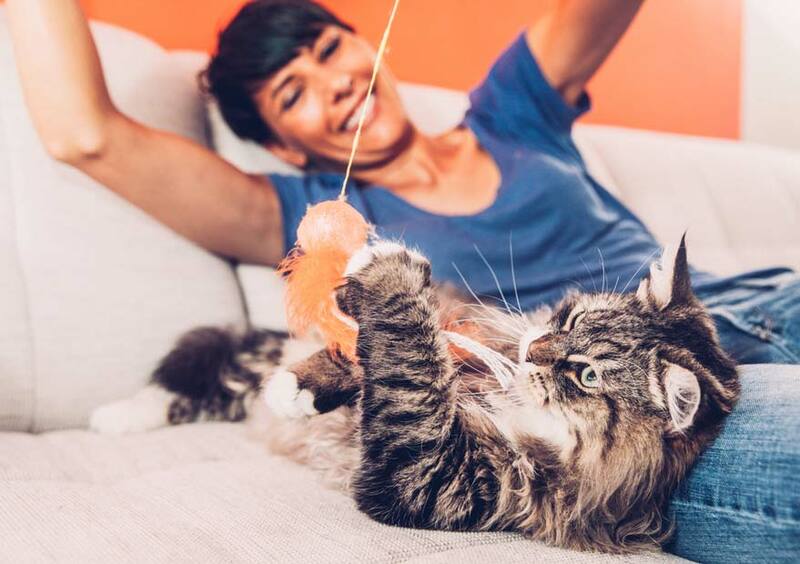 Playtime helps a cat stay physically and emotionally happy and helps relieve his stress, so he's less likely to engage in negative behaviors in your home. Let's explore the best techniques for playing with cats that maximize those benefits. Interactive play, or games which engage both you and your cat simultaneously, are best for cats most of the time. Certainly, they will play alone sometimes, too, and that's bonus playtime, but interactive play should be scheduled in at least daily, too. The reason interactive play is the best type for cats is because it mimics hunting behavior. You use a toy that can be manipulated to act like a bird or rodent, allowing your cat to use all of the predator instincts that are just waiting to leap out. If a cat isn't able to express those evolutionary urges, it's highly possible that he will become bored or, worse, frustrated and stressed. Those feelings often leads to inappropriate behaviors like urinating outside of the litter box, scratching inappropriate items, or engaging in aggressive behavior toward humans or other pets in the home. Here is a guide for playing interactively with your cat. Get some interactive toys. Wand toys work great for mimicking birds, and they can also be slithered along on the floor like rodents. Throw toys can also work well, though it's not as easy to make them act like prey and also keep your hands out of the way. However, cats do love to chase them, and some can be taught to bring them back. Keep the toys put away between play sessions. Wand toys with strings can be dangerous to cats if they're left out because they can be a strangulation danger if the kitty gets wrapped up in them. Also, cats can become bored or disinterested in toys that are just lying around, imitating dead prey. Make the toy act like proper prey. Generally, cats' prey doesn't move toward them. It runs or flies away, sometimes freezes in fear, tries to get behind or under things, and then darts away in a different direction. Think like prey when you're doing interactive playtime with your cat to make it as realistic and challenging as possible. Let your cat make the kill. Periodically during the play session and especially at the end, make sure your cat gets to make the "kill." That means letting him catch the wand toy or throw toy and give it a killing bite. Follow the session with a tasty treat. After a kill, a cat gets to eat. End the play session with a yummy tidbit, which your successful hunter has earned, and then he'll probably take a bath and a nap. Strive for at least 10 minutes a day of interactive playtime with your cat. If you are strapped for time and just can't get it in some days, you can try an automatic cat toy, which mimics rodent behavior, but you must be sure to let your cat catch something, like a throw toy, at the end of the session, or he might get extremely frustrated by his inability to catch the mouse.